How much do you save so far, including everything you saved for retirement such as 401(k) and IRA, etc? What’s your monthly savings, including contributions to 401(k) and IRA every month? Most aggressive: 100% stocks, 0% bonds, 0% short-term. The goal at retirement, according to Fidelity, is generated based on replacing 80% of our pre-retirement income (the numbers I provided are our joint incomes and savings). Though I think 80% of pre-retirement income in retirement is a little bit high, what really shocked me is the target: almost 6 million!!! What’s even worst is that using the current model (no. 4, 70% stocks, 25% bonds and 5% short-term), we won’t hit the target at the age of 65 whether the market performs poorly or on average (which is more likely). I never really thought how much we are going to need for retirement, the most I guessed was 2 million after reading some articles early suggesting a moderate number of one million for each to maintain the life style. The Fidelity target, however, seems somewhat excessive and I don’t think we will ever reach it. Of course, the estimate assumes everything (income sand savings) remains the same for the next three decades, except inflation adjustments. Well, this is just one (probably the most challenging one) of many scenarios we could face for our retirement and the picture isn’t pretty. In any case, there’s still a long way to go for us. Go to myPlan check how much you are going to need for a comfortable retirement. What follows may be advertisement. 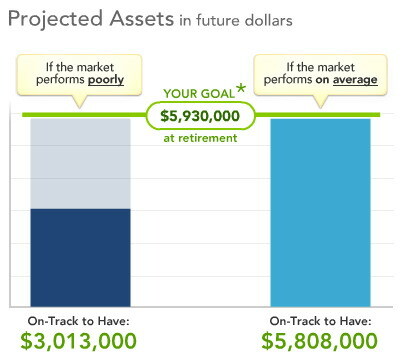 keep in mind that the Fidelity model uses an 85% last income replacement ratio. That may account for why their number seems so high. If you dont need that kind of money to live off of in retirement, then you may want to look for a calculator that will let you specify your desired assets at retirement, or your desired income in retirement.